The holidays are quickly approaching and homeowners are getting in gear with reorganizing homes to meet this much anticipated time of year. 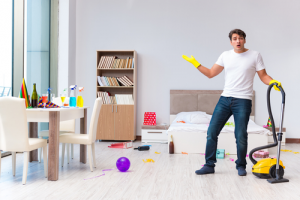 Nevertheless before getting started with all the exciting stuff like setting up lights and decorations doing a bit of holiday cleanup should help to make your job a whole lot easier while providing a clean, reorganized, living space. When doing this people are urged to make an extra effort to apply eco-friendly waste disposal as it not only promotes safety and healthy living but it has an overall positive impact on the environment. In most homes holiday cleaning usually results in a whole lot of items to be rid of for instance people dispose of unwanted or malfunctioned electronics, furniture, refrigerators, yard waste and so much more however with improper waste disposal and environmental damage becoming such a growing concern the need for responsible waste disposal has become an urgent one. Nevertheless there are several eco-friendly waste disposal practices that can be adopted to make for safe, environmentally friendly, holiday cleanup as well as to help address or eliminate critical issues that hinder the process of effective waste management. Recycling and reusing products, proper disposal of hazardous waste and using bio-degradable , eco- friendly products are all great ways to promote healthy waste disposal practices. They also serve to prevent contamination, pollution or any major health or environmental issues. Most times waste/junk removal can be a very tedious undertaking requiring substantial time and effort to be carried out safely and efficiently. Apart from this it can also include the removal of large, heavy or hazardous items that can be dangerous if handled incorrectly. This is why it is recommended that people contract professional waste removal services to come in and give them a hand. From kitchen waste to old refrigerators these services essentially serve to ensure safe waste removal and disposal while helping to keep the environment clean. On another hand we know that there are certain types of waste that aren’t collect by regular trash services leaving homeowners to deal with it themselves so by contracting these services homeowners can get these waste items managed without any hassle. Benefit from our top rated, affordable, services and play your role in keeping the environment clean and safe. Visit our website at www.junk-king.com to book online or call us at 1-888-888-JUNK to schedule an appointment right away. This entry was posted in Uncategorized and tagged foreclosure clean-outs, furniture removal, furniture removal marin on November 27, 2017 by Julian Torres, "JT". Last updated December 19, 2017 .